Hanul Family Alliance is partnering with the University of Illinois at Chicago in their Fish Consumption Research Project looking at mercury level in the body. The research is being conducted by Susan Buchanan and Mary Turyk at the University of Illinois at Chicago (UIC) School of Public Health. The study is funded by the National Institute of Environmental Health Sciences. The purpose of the study is to test a text messaging program to promote healthy fish consumption in reproductive age Asian women in the Chicago area. We want to know if the program will help women decrease the amount of moderate and high mercury seafood they eat. 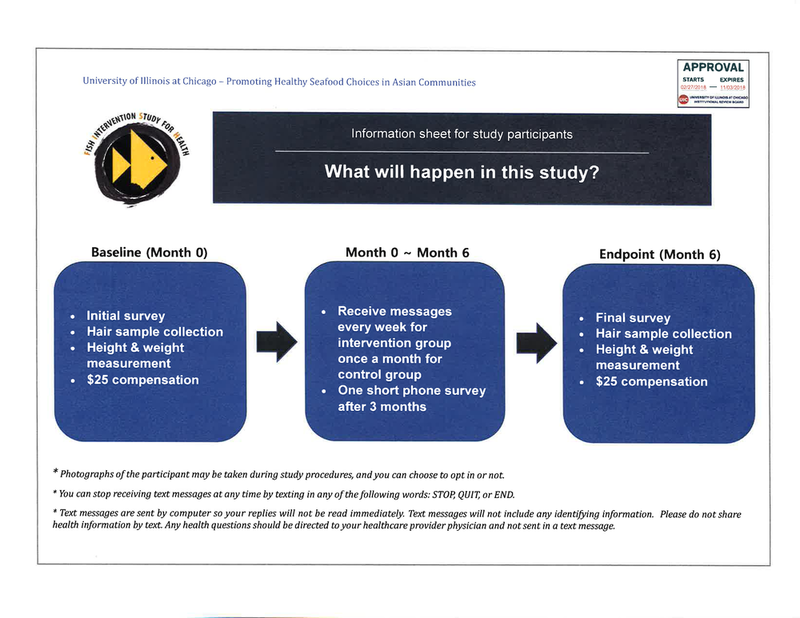 Study participants will be assigned by chance to receive text messages about fish consumption (intervention group) or to receive messages about general nutrition topics for 6 months (control group).